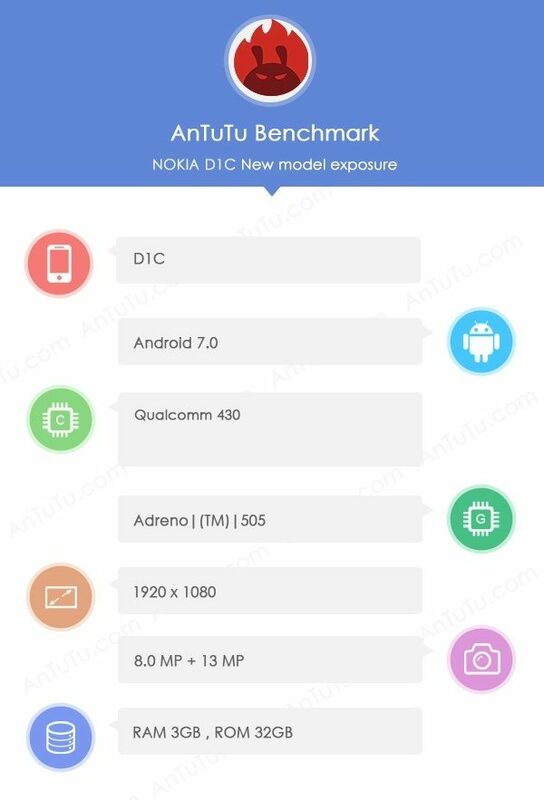 The Nokia D1C was largely revealed when it first made an appearance onto Geekbench a while ago, and now the smartphone has appeared on AnTuTu. This further confirms that Nokia is coming back to the mobile business, along with revealing that the phone will have a Full High Definition panel. It is always exciting for those that still have a soft corner for the Finnish phone company to get confirmations about Nokia's return. If you do not know much about the D1C already, check out the screenshot and the specifications listed below. From what we can see here, the D1C is a low-mid range device and definitely not the higher end model that we are still waiting to get a hint of, via leaks. If reports are to be believed, then the company will make its comeback with at least one more smartphone, if not two. We will let you know as soon as more news turns up.